It is astonishing when you think about it that dentists are not given training in dermal fillers as part of their standardised study to become dentists. After all, they spend their entire working lives examining their patients’ faces and trying to ensure that they are as healthy and as cosmetically pleasing as possible, offering them treatments that range as widely as dentures to ensure that the face shape is consistent, to veneers to ensure that teeth are straight and white, to braces to ensure that the jawline is correct. It is a very small step to then consider dermal fillers, which in some cases provide the exact same result in maintaining the facial shape and ensuring that the best cosmetic outlook is offered to the patient. A new training course is seeking to rectify this, and is offering dermal filler training to dentists who live in the Los Angeles area. So what are dermal fillers? Put simply, a dermal filler is an injectable cosmetic chemical that is placed just underneath the skin in order to fill in any wrinkles or loss of softness, in order to create a much smoother appearance on the skin. Many people talk about them in the same breath as Botox, and although they aim to solve a similar problem, the approach is very different and uses the body in a different way to achieve that wrinkle free look. Instead of paralysing the muscle so that it cannot crinkle, as Botox does, dermal fillers actually plump up the skin to return it the softness and smoothness that it has lost. There are currently six different types of dermal filler chemical that is FDA approved for use in the US, and this training course includes training in at least three of these. Typically, for a dermal filler course Los Angeles would not be the first place that you would consider, and yet that is the location of this day of training. For many medical professionals just having a one day training course for such a complex area of medicine – and one that, should it go wrong, would be instantly obvious to the patient and all around that – would simply not be sufficient, but that is where the difference lies between dentists and many other health professionals. As a dentist spends each and every day working with the face, the different muscles and nerves, seeing how a person’s face changes over the years and with time, they are perfectly placed to understand just what a patient may ask of them when it comes to dermal fillers. Dentists also have the advantage of much experience with needles and injections, something that not every medical individual can boast. Like any training course it is only as good as its instructor, and that individual is Dr Howard Katz. World renowned for his experience and research into Botox injections – to the point where he actually owns the patents for most of the equipment used in the administration of the medicine – he also has a wide knowledge base in dermal fillers, and has been teaching this training course for over twenty years. Much of the teaching that he now performs is overseas, in colleges and institutions based in many parts of Europe, South Africa, and even in places such as Israel and Saudi Arabia. 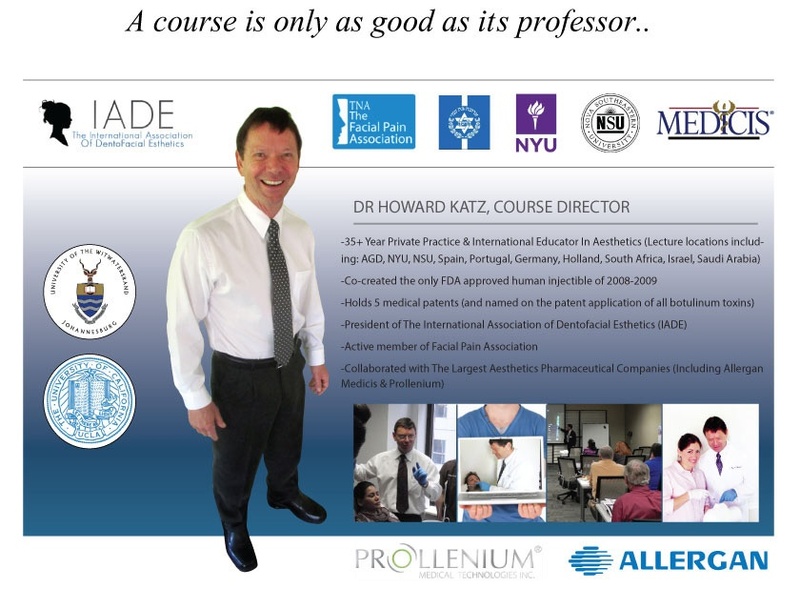 As the medical field has evolved, so has his teaching, and so Dr Howard Katz remains a leading expert in this area. For those who live in and around Los Angeles, his training course provides the opportunity to learn about dermal fillers without losing more than just one working day. Improve your dental practice with Botox certification, the medical opportunity that could not only help the lives of your patients but also increase your bottom line and support the growth of your business. You may not have considered Botox ever before, considering it not that similar to dentistry, but a new training course that has been developed called Dentox has shown people that that simply isn’t true. Anyone who has dental training can easily pick up the skills that are required for Botox administration, and this course could therefore double the number of patients that you have coming through the doors of your dental practice. Sometimes running your own business by yourself can be an overly demanding thing, and you can start to tire. You start to lose track on new opportunities, and you feel as though you could do with some advice about how to increase your business. Dentox is the perfect answer to this problem, not only giving you new skills that you can use during your practice, but also providing a way for you to transform current dental patients into new Botox patients. The crossover from your two skill sets could double your bottom line, giving your dental practice a new lease of life and ensuring that you do not have to worry about improving your business from pure dentistry alone. Many medical professionals, including dentists, have for some time looked down on Botox as a purely cosmetic procedure, and it is true that in many cases that is the reason that the patient chooses to have it. But that is not something that you should penalize patients for: after all, how many of our patients come into our consultation rooms looking for braces, or teeth whitening, or veneers? The desire to look good does not have to be a bad thing. Furthermore, Botox administration is often now used in many medical treatments, including those who have nerve pain, people who struggle with oversweating, and even people who have severe migraines. Opening up your dental practice to all of these people would not only benefit you, but also benefit them. Now is the time to take the step towards Botox, and take part in the exciting training course that Dr Howard Katz has put together: a course that not only takes just one day so that you only miss one day of work, but it is also taking place right here, in New York on February 3rd 2017 making it possible for you to be home by dinner time! Now that Botox training is within your reach, you should consider seriously whether this is the perfect time for you to diversify. The training day itself will actually offer three methods of increasing your patient numbers and income – the standard Botox training, then dermal filler training, and then platelet rich plasma, an area that is not often covered. As well as the expert training offered by Dr Howard Katz, you will be able to practice on live patients who will actually be at the training event too, so you will be able to leave with confidence in your new skills. Spaces are going to be limited to this fantastic event, and there are going to be plenty of New York dentists who see the value of expanding their dental practice in this way, so we would recommend that you book early to make sure that you are not disappointed. This one day could mean the difference between your dental practice going on as it always was, or completely changing your fortunes and offering you the chance to really make something of it. Take that chance, and receive your Dentox training. The world of business is becoming even more cut throat with every passing year, even within the medical field such as dental practices. When you have trained for almost all your life in order to carry out a profession that is as intense as being a dentist, you want some reassurance that you are going to be able to make a living for the rest of your life – but that is not always necessarily the case. For dentists who are looking to expand their practices, it can be almost impossible to consider exactly in what direction that could be done, but there are simple additions to your repertoire of skills that could really transform not only your dental practice, but also your bottom line: and that is Botox. If you are one of the medical professionals who has looked down on Botox, then now is the time to stop. Although it was once considered the desperate steps taken by Hollywood actresses to keep looking young – and often the unwise mistake that scarred them for life – not only has our understanding of what Botox is improved, but so has its medical use. If you decide to train to administer Botox you could easily find just as many patients coming to your dental practice to ask for help with persistent migraines, back pain, or oversweating in the palms than those who want some of their wrinkles ironed out. Unlike most new fields of medicine, Botox training is within your reach, and especially so because you already have your dental training. There is a huge amount of overlap to be found when it comes to Botox administration: think about all of the times that you have administered an injection, prepared a patient for surgery, or talked them through the different treatment options that are available for them. All of these skills are essential for anyone who is going to offer Botox to their patients, and so with your years of dental knowledge you are primed to be able to receive your Botox certification. The only downside is that in most cases, you would have to travel someone, pay a fortune in training fees over the week, find someone to stay that wasn’t too expensive, be away from your dental practice for that time, and worst of all, be apart from your family. Many dentists simply figure that isn’t enough to tempt them to train in Botox – which is why this training is a little different. Instead of lasting a week, or even more, this Dentox training (Botox training for dentists) has been carefully created to take place in just one day; and more impressively, the expert trainer is going to come to you. Dr Howard Katz will be giving his world renown training in Los Angeles on January 14th 2017, and you could be a part of it. You may not have heard of Dr Howard Katz, but absolutely anyone within the Botox field definitely has, and you’ll soon get used to hearing about him: after all, he holds the patents to almost every single chemical and tool that you will use during your Botox training and practice! His decades of research and dedication to understanding absolutely everything about Botox administration has led to him being called a world leading expert, which is certainly true. 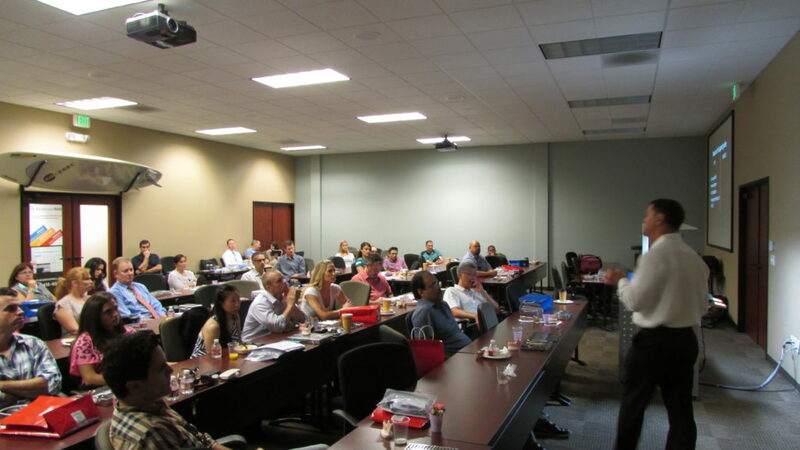 Dr Howard Katz is passionate about the dental profession enlarging their knowledge base, and this is the perfect chance to get all you can from his expertise. There’ll even be live patients to practice on during the day of training, so you definitely should not miss out on this opportunity to change your dental practice business forever. A few injections of Botox – carefully placed by a skilled hand – may be all it takes to relief one of life’s most painful conditions, a kind of facial pain called TN. Trigeminal neuralgia is often simply called TN or sometimes referred to as tic doulourex. Whatever you call it, the condition involves severe facial pain that patients often describe as a sudden stabbing pain. The original study showing the potential benefit of Botox was small and short – but the results were nothing short of amazing. Involving 13 patient with trigeminal neuralgia, the results were so promising that they justified a larger and longer trial. Researchers involved in the original study include E.J. Piovesan, MD, a Panama neurologist with the Hospital de Clinicas da Universidade Federal do Parana. The study was published in the journal Neurology. Since the initial study, more research has proven the findings to be true. In the original study, before having Botox all the patients had severe face pain linked to trigeminal neuralgia. They got a single carefully planned Botox treatment. In all 13 patients, there was an easing of pain gradually over 60 days. Just 10 days after the treatment, there was a significant drop in pain. Within 20 days, some patients were nearly symptom-free. For all, pain intensity dropped and there was a reduction in use of pain medicine. Those are promising results indeed. And remember that the results of this small and short study have been proven again and again in other research. Four of those original patients stopped using medication altogether. Other cuts usage of pain medication by over half. And even better, Botox didn’t seem to interact badly with the pain medicines these patients were taking. And after 60 days, the relief continued. Other research indicates the benefits could continue for much longer. TN is one of the most painful conditions a human can have, according to doctors. The classic form of this condition – called TN1 – involves sporadic, sudden and extreme cases of a sudden burning or shocking in one of the branches of the fifth cranial nerve. This means the symptoms can be felt and seen in the lips, nose, eyes, scalp, forehead or either jaw. Episodes may last only a moment or last as long as 2 minutes. The pain may happen all at once or in volleys over two hours. The pain is usually described as sharp and stabbing. In another form of the condition, TN2, pain is less intense but constant. It’s possible for a patient to have both conditions. Dr. Katz suggests that the sites to be injected for TN treatment vary according to known trigger zone areas. These differ from one patient to the next. Injections should only be given when the motor side effects of the Botox treatments do not cause severe facial esthetic or functional distortion. These may be reduced or even prevented by injecting 0.025ml of concentrated Botox at the trigger zone. Suggested in a groundbreaking small, short study and shown to be true in other research since, Botox can make a huge difference in the lives of TN patients. But someone has to be willing to provide the shots that provide the change. Would you like to be involved in a Botox practice that makes a real difference in people’s lives? It’s possible when you take our Botox training course.. and step forward as an expert in treating conditions that simply can’t be successfully dealt with any other way. One of the key things that any medical professional should know is not something that many medical schools will teach. It’s not something that you will be able to learn from a medical textbook, and it is rarely something that is discussed openly with the medical community – and that is being paid by your patient’s medical insurance. Money matters should not be something that we avoid, and we should always be open with our patients about the cost of the treatment that we are giving them, along with the many medical and cosmetic benefits that they will receive. This ensures that the process of gaining the attention of their insurance company should not be too difficult. When you contact a medical insurance company, you will need to have a letter of medical necessity from their primary care physician. When you have a consultation with them they should be able to hand that over, and you will then be able to forward that on to their insurance company. In this letter of necessity, it needs to have their complete migraine diagnosis, and this needs to include the fact that they have had migraines of this severity for at least six months and for at least fifteen days per month. It also needs to state by their primary physician that all oral medications that they have been prescribed have been completely ineffective. Once you have done this, the medical insurance company should allow you to proceed and give the treatment. If a patient requires ongoing treatment, then you will need to demonstrate to the insurance company that there has been at least a 50% improvement to their medical migraine condition since the first lot of treatment, in order to convince the insurance company to continue to cover the cost. Dr. Katz’s full botox program. Botox is not a magic potion. It cannot fix absolutely everything, much as we would wish it, and sometimes when less experienced individuals administer Botox, it can create inadvertent side effects that the patient was definitely not hoping for! One of the most common Botox side effects that people worry about is getting the permanently surprised look – something that some celebrities get when they decide to have too much Botox. So if a patient comes to you with the ‘surprised!’ look side effect, how do you go about fixing that – and how can you yourself make sure that you never make that mistake? The ‘surprised!’ look is often created because the patient’s eyes are now naturally far too wide and open, giving them that ‘deer in the headlights’ sort of expression. This happens because there are two main muscle groups on our foreheads: one group that pushes downwards, and one group that pulls upwards. Some Botox professionals will only give Botox injections to the muscles that push downwards, and when they relax it means that all that is happening on the patient’s forehead is pulling upwards! This creates the startled look. If that does happen, or a patient has come to you with that side effect, it is an easy enough problem to remedy. All you need to do is give them two small injections near the top of the forehead, to relax the muscles that are continuously pulling upwards. This balances out the muscles in the forehead, and means that their forehead is able to relax, balancing out their features, allowing the eyes to naturally relax, and removing the ‘surprised!’ look that they had. As this happens with 1 in 20 patients you may find it a common problem that people ask you to fix. Learn about Dr. Katz’s full botox program. If there is one thing that almost every single person becomes self conscious about in their life, at one point or another, it is their smile. For some people it is the colour of their teeth, and for others it is any gaps in their teeth that they have. For some people it is the lines around their mouth that appear when they smile, and for others it is an imbalance between the size of their nose and their mouth. For whatever reason, you as a Botox medical professional may find during your professional career that you often see people come to you and ask you to ‘fix their smile’. So what does this mean in practice? Well, most of the time that a patient who dislikes their smile goes to a Botox professional, it is because they have a very gummy smile – and they want you to be able to change that. What your patient probably doesn’t know, although you will, is that the muscle that controls the way that our smile looks and can create a gummy smile is the same muscle that controls the nasolabial fold. This means that if your patient with a gummy smile also has a deep set nasolabial fold, you will be able to give them the good news that it will be simple for you to transform their face and smile completely with just one set of injections. Very few patients hate their smile so much that they will attempt to medically alter it, but if this does happen then we as medical professionals are honoured to be able to transform their smiles and therefore indirectly transform their lives. Confidence is something that money can buy, and it can be achieved through well thought out and talented Botox injections. About Dr. Katz’s full botox program. Research seems to have proven something pretty amazing: Botox can offer dramatic relief from facial pain – even severe facial pain – when injected properly and in the right places. In the original study on the topic, botulinum-A toxin – what we simply call Botox – was injected in 13 patients with a severe facial pain condition called trigeminal neuralgia. The injections were carefully placed directly into key positions in the face of the patients, and the result was a dramatic reduction in pain. In fact, 4 of the 13 patients in that original study no longer needed any oral pain medication at all, and the remaining patients all reduced the amount or pain medicine they needed by over half. 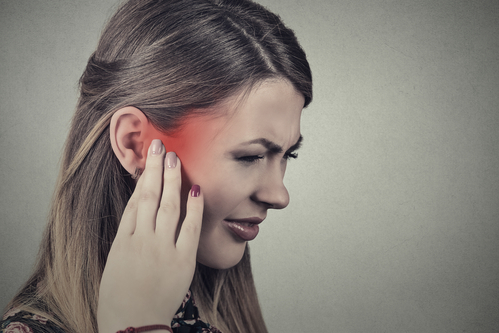 That’s especially hopeful information for sufferers of trigeminal neuralgia since drugs aren’t always very helpful for them, according to neurologists familiar with the research. Also, some patients with the condition choose to avoid pain drugs because of unpleasant side effects and the possibility of pain becoming more intense and lasting longer. To determine how much Botox should be used for this kind of treatment, an open-label study was conducted involving 13 patients to determine the minimal dosage. All of these 13 patients met the criteria for trigeminal neuralgia established by the International Headache Society. Four patients experienced symptoms in just one branch of the nerve while others had symptoms in two or more branches. Patients were asked to report how much of their regular medication they needed before beginning the study and then at 60 days after having the injections. All patients started with severe pain and improved. The amount of the dosage depended on how much surface pain was reported and ranged from a low of just 6.83 units to as much as 9.11 units. Pain was shown to gradually reduce, and the Botox injections reached a peak of effectiveness 20 days after treatment. After 60 days, 4 patients no longer needed pain medication at all. The rest had reduced medication by half or more. There were 3 patients in the study who took more than one drug before the Botox treatment, and they all reduced to one drug at a lower dosage. The study did not involve a long enough time frame to determine how long the Botox treatments last. But later studies have proven that the results from the original study are sound and that results can be longlasting. Trigeminal neuralgia is just one of the many medical conditions that may benefit from Botox treatment. Others include eyelid and ocular muscle issues, blepharospasm, dystonia, strabismus and more. 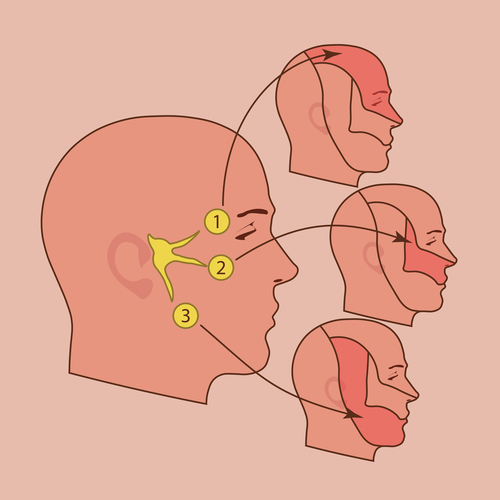 Also called simply TN, trigeminal neuralgia is known to be one the most painful human medical afflictions. 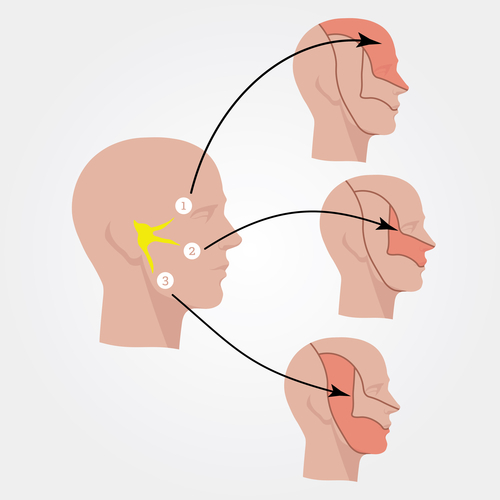 The disorder of the fifth cranial nerve causes extreme, sudden and sporadic burning or shock-like sensations at the nerve’s branches in the lips, nose, face, eyes, forehead, scalp and jaws. Pain can last from only a moment to as much as two minutes. Attacks may happen rapidly and frequently over a two-hour period before subsiding. 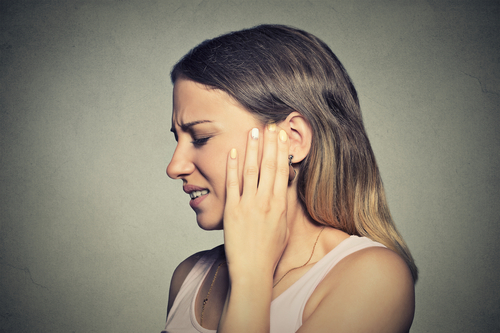 Some patients have a form of the condition called TN2 which involves constant pain at a lower intensity. Dr. Katz understands that not all trigeminal neuralgia patients are alike, and he indicates that the sites injected for trigeminal neuralgia vary according to know trigger zones that differ from one patient to the next. It’s important, he adds, that injections are only given so that there are no motor side effects and no severe distortion of facial esthetics or changes in function. Any possible unwanted impacts can be reduced or even prevented by injecting 0.025ml of concentrated Botox at the trigger zone. Great for aesthetics and life-changing for therapeutic purposes, Botox is a wonder drug for some people. And the people who choose to offer Botox injections are often seen as miracle workers by those who can find relief no other way. If you are a medical professional interested in learning to treat your patients with Botox, call (858) 550-9533 today. Very few people in the world would happily pick up a yoghurt that was six months out of date, and eat it with a spoon and a large smile on their face. Why? Because we have been conditioned for years to pay attention to use by dates because we believe that they are there to protect us – and we know, because we have been told so often and from so many quarters, that using something that is past its use by date is just dangerous. It won’t be as good! Many medical professionals have the same approach to the Botox that they use. Every medical professional who works with Botox will know that if you mix your Botox with saline, that solution will be able to be used for up to two days, which is a not long time – but it could be longer. The manufacturers of the most Botox solutions always recommend that you mix it with saline, but we would recommend that instead, you mix it with bacteria static saline. If you do that, that solution will be perfect for using for up to two weeks, a whole two days longer which will enable you to keep it for patients that you want to see after a weekend, for example. After that, the Botox is considered to be out of date, and its shelf life has come to an end. Altering the length of time that you can use your Botox solutions means that you could really easily save a lot of money, because you will not have to throw out your Botox solutions every two days. This will dramatically change your spending habits at work, and will make Botox injections even more cost effective than they already were for you and your practice. Read about the full botox program.